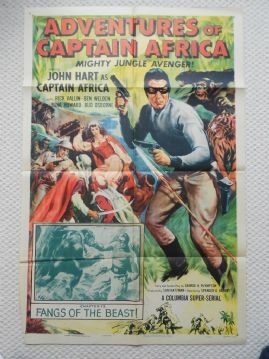 1955 original movie poster from the film ' Adventures of Captain Africa ' starring John Hart, Rick Vallin and Ben Welden. This film was a Columbia serial film and this poster represents Chapter 12. This poster is in VG++ condition and measures 27" x 40". This poster has tiny separations and a couple of small tear holes by the bottom right fold. A seriously rare poster to display as is ( which would look great ) or if you restore it the cost would be minimal and you would have the perfect poster. The poster will be shipped folded in between sturdy pieces of cardboard.